A mysterious new Soul Arm, the Eternal Oath, has just appeared in Sapphire. Many heroes have already embarked on a journey to obtain this legendary bow, but will you be the first to succeed? Take a look and learn more about the Eternal Oath below. Eternal Oath’s prototype is Aphrodite’s weapon. It has the graceful appearance of a pair of Angel wings, along with a sleek curves and an intricate design to really dazzle the battlefield. Sacred Arrow: Fire a Sacred Arrow that blesses the squad, restoring HP equal to 58% of ATK; also heals 2 allies with the lowest HP percentage for another 20% of the previous amount; additionally reduces damage taken by the squad by 5% for 1 round. 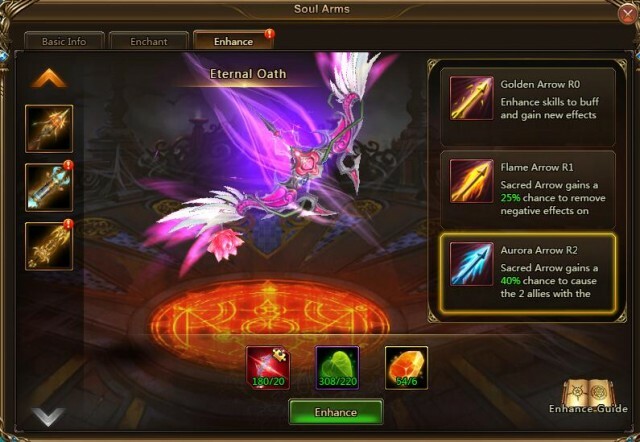 With this powerful support skill, Eternal Oath is no doubt the perfect Soul Arm to protect your heroes. Players can further strengthen its Sacred Arrow through Enhancing. There are three kinds of buffs, Golden Arrow, Flame Arrow, and Aurora Arrow. Each skill can be enhanced to from R0 to R6. Which to enhance first? It depends on your strategy. As a healing Soul Arm, Aurora Arrow provides great healing buff. Aurora Arrow can help Eternal Oath gains up to 100% chance to cause the 2 allies with the lowest HP percentage to be immune to death for 1 round, which will make your heroes unstoppable when it take effect! 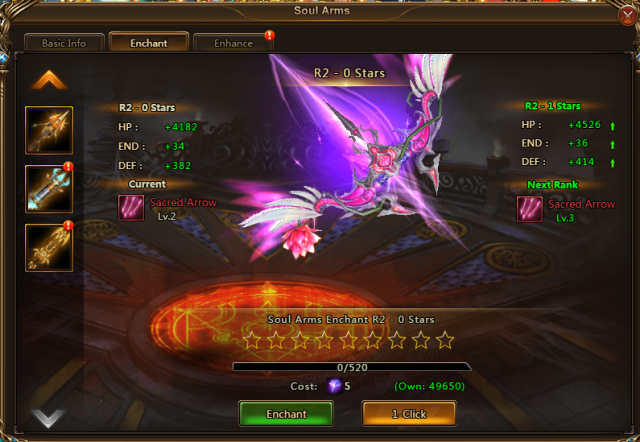 Enchanting can also improve Soul Arm’s skill and bonus attributes, to make Eternal Oath’s healing effect a literal lifesaver in battle. Eternal Oath will be available in game Events from Jan 20th to Jan 22nd. Participate and collect shards to activate your own Eternal Oath! Follow the League of Angels II official website and Facebook fanpage to get more news about Eternal Oath.